Note: Aria Resort, Vdara Hotel, and Crystals are sponsors of Technology Report’s CES Coverage. 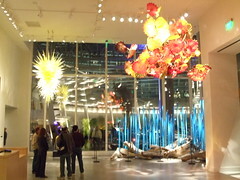 Next to the ARIA at CITYCENTER Las Vegas are two spectacular art galleries – one with Chihuly Glass Sculptures. Chihuly glass is also in the incomparable Bellagio Lobby ceiling. However the glass “flowers” are backlighted at the Bellagio – against the artist’s wishes I understand – making the glass less striking than in the CITYCENTER gallery where the special lighting effects blend with the colors and glass to make spectacular pieces.